Powertrain focuses on driveshaft parts for many of the popular foreign rear wheel drive cars and light trucks on the road today. We offer repair components for Nissan, Toyota, Mazda, BMW, Mercedes, Audi, and more. 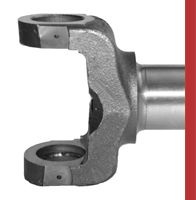 We also have developed an easy way to find the pinion yoke for most domestic differentials. 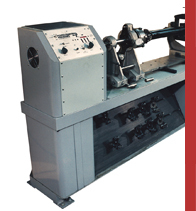 Check out the broad list of parts in the Catalogs section of this site. Are you looking for a complete shaft that is dynamically balanced and ready to install, Powertrain has the broadest selection. Many of our customers prefer to buy the complete shaft rather than purchasing the individual parts and having to assemble them. We build these shafts every day, know the ins and outs of foreign driveshafts, and usually have them ready to ship when you call. 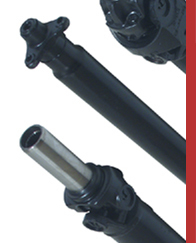 Powertrain also supplies shafts for OE applications in limousines, mid-size buses, power boats, industrial drives and more. If you repair or rebuild driveshafts, a balancer is a must. Our Accupower Driveshaft Balancer combines flexibility, accuracy, and simplicity in an affordable machine that helps your shop provide a superior product and additional revenue.